Members of the Wesleyan community here and across the country are engaged in exploring, ameliorating, and solving the crises that surround the mass incarceration—and disenfranchisement—of a vast segment of the American population. This year on campus, a confluence of programs—from the First Year Matters Common Reading, to a Course Cluster, to the annual Shasha Seminar on Human Concerns—has highlighted a kaleidoscope of issues surrounding the U.S. prison system. Director of the Jewett Center for Community Partnerships Cathy Lechowicz has described this burst of conversations as “synchronistic,” and underscoring concern at the national level. The First Year Matters program, led by Vice President for Student Affairs Michael Whaley, introduced Michelle Alexander’s book, The New Jim Crow: Mass Incarceration in the Age of Colorblindness, to the Class of 2020 as the Common Read prior to Arrival Day. Whaley and his team arranged for campus discussion groups and lectures. They also produced a video with students and professors—William Griffin Professor of Philosophy Lori Gruen; Class of 1958 Distinguished Professor Lois Brown; and Assistant Professor of Science in Society Anthony Hatch— responding to the book, including its thesis: that mass incarceration has disenfranchised our citizens and communities of color. Gruen, who also teaches in Wesleyan’s Center for Prison Education, says. “One of the really remarkable things about having a whole firstyear class read The New Jim Crow, was it brought to awareness, for some students, just how pervasive this problem is. For other students who had family members impacted, it opened the conversation so they could feel less isolated. “People often don’t even know where prisons are located—it’s that kind of shadowy idea of incarceration that we need to challenge. The more people who become aware of the problems of mass incarceration, the more people will be able to help solve it.” Hatch facilitated one of the lectures and also taught a First-Year Seminar class, concurrently writing a book about mass incarceration. “It was, for many students, their first exposure to the problems of the prison—and it was a process of constant revelation of suffering, catastrophe, of pernicious policy problems. The entire conversation last semester brought issues of racism to the fore. Meanwhile, several professors had arranged a course cluster through the Allbritton Center for this academic year, exploring aspects of mass incarceration. Professor of English Sean McCann and Professor of History Demetrius Eudell each taught a course last fall; College of Letters Visiting Writer Charles Barber ’85, coteaching with Yale Professor Chyrell Bellamy, offered a service-learning course this spring. Barber had proposed the cluster because his students were intrigued by his “day job.” A local nonprofit director, he researches criminal justice issues and previously directed programs for clients who regularly found themselves in the judicial system. “We’ve come to realize that the punitive turn in American culture resulted in the imprisonment of a vast number of people and drew off a huge amount of resources to maintain this system,” he says, referring to the “tough on crime” era in the 1980s–’90s. For their cluster course, Barber and Bellamy presented “The New Haven Model,” a citizenship course offered at soup kitchens, which teaches “The Five R’s of Citizenship”—rights, responsibilities, roles, resources, and relationships. Students partnered with Bellamy and Barber to analyze their research data. The Center for Prison Education (CPE), housed in the Allbritton Center, offers a more direct intervention in the prison system. In the CPE, Wesleyan faculty teach courses equivalent to those they offer on campus, and students from campus serve as teaching assistants. Since its founding in 2009, professors have offered 77 credited courses, with 97 students already served, and 60 students now enrolled. In October, the CPE co-sponsored the annual Shasha Seminar for Human Concerns, created by James Shasha ’57, P’82, this year exploring “The Role of the University in the Era of Mass Incarceration,” and drawing a host of alumni and others seeking change. “The United States has five percent of the world’s population, but 25 percent of the prison population,” keynote speaker Michael Romano ’94 told those gathered in Memorial Chapel. Romano co-founded and is now director of the Justice Advocacy Project at Stanford Law School, which helps to win the release of those sentenced to life terms under the California’s 1994 “Three Strikes” law for nonviolent, even petty crimes. Students staff the project, work with clients, and study legal reform issues. Romano began the project when he noticed that, while much attention (“justifiably,” he adds) was given to the wrongly convicted, “the most massive injustice—in terms of sheer numbers—involves people who were guilty but punished unfairly, even unconstitutionally. “It’s work that schools and universities can do,” he says. Representing marginalized populations serves society but offers no profit; however, “It requires people with curiosity, eager to look at problems in a new light— and gain the skills to take action.” Additionally, the Stanford Advocacy Project offers supportive housing and assistance in finding employment for their clients after release. “Prisoners often fantasize about having a big party as soon as they get out,” says Romano. “That’s a recipe for disaster.” Instead, he and his staff literally meet their client at the prison gate. The Stanford Advocacy Project is a gamechanger. Those released under it have a 10 percent recidivism rate—50 percent below the national average. 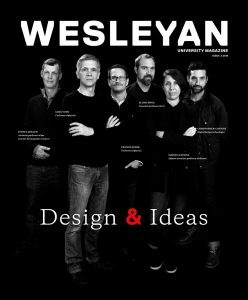 “A liberal arts school like Wesleyan could be a leader here, because the answer to ‘How many days do you keep someone in?’ is not a simple equation. A just response involves philosophical, moral and normative questions about retributivism. It calls on psychologists, philosophers, biologists, and criminologists; it calls on political scientists for the management of government resources.